Update, October 24: Destiny 2’s PC release is nearly here, and Bungie have no plans to change their approach to aim assist just yet. Destiny 2’s aim assist has been a hot topic since the PC beta, as its generous nature has some players concerned about its effect on the balance of competitive play. 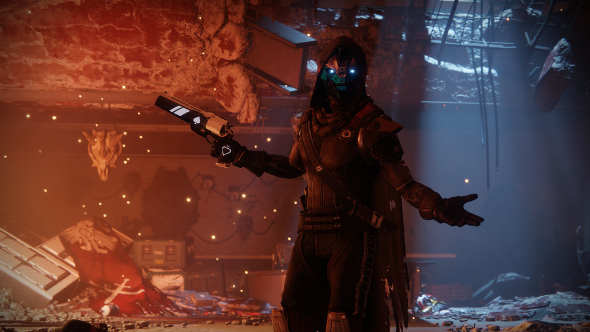 Some players say it’s seriously over-powered, others say its effect is negligible, but everybody agrees that the Crucible will soon be filled with players complaining that the assists offer an unfair advantage. Use our Destiny 2 PvP guide instead of aim assist to gain a competitive advantage. Update August 31, 2017:A Destiny streamer has tested various input methods in the Destiny 2 beta, and shared some thoughts about aim assist. After rumblings on Reddit (see original story, below) about the presence of aim assist when playing Destiny 2 PC with a controller, pro Destiny streamer Dr Lupo did a bit of testing. Besides using the native mouse-and-keyboard (MKB) and a controller with aim assist, he also used a XIM input adapter to play with MKB andaim assist. He says gameplay outcomes vary depending on the weapon, and that, in his experience, aim assist isn’t that big of a deal, given average skill. Ina further statement to PC Gamer, Dr Lupo points out “the XIM still involves translation, which means it will never be as precise as a native mouse.” He also acknowledges that the existence of any aim assist will give salty players a cop-out excuse for losing, inviting toxicity in the community. Lupo’s view seems to be that aim assist doesn’t make enough of a difference to imbalance the PvP game for casual players, and opens the game up to a larger audience. However, he recommends it be removed from PvP on PC if Bungie hope for Destiny 2 to be taken seriously as a competitive game, but if they don’t, it should be left as is. It’s interesting to compare his remarks with the Reddit thread we found yesterday (see original story, below). The OP of that thread claims the controller aim assist is so huge as to be “VERY OP” in itself, while the top-voted reply suggests that controller spoofing (e.g., via a XIM) while using MKB would be another level of broken. I tried playing with a controller in the beta last night. The aim assist does make weapons noticeably stickier over an opponent’s head and I was able to compete, but most of my games with MKB went better. My suggestion would be to enable aim assist in the quickplay playlist, and disable it for the competitive list and/or the forthcoming Trials mode. The bifurcation of competitive and casual PvP is already right there in the game – why not make aim assist another aspect of it? Original story August 30, 2017:Bungie have promised that, if you prefer the feel of a controller, the PC version of Destiny 2 will support it – to the point where you can have both a controller and keyboard-and-mouse plugged in, and can switch between the two on the fly. Bungie have even implied that the game will make adjustments when it detects controller input, and it looks like the impact of that is pretty far-reaching. So it seems the aim assist for controller input needs to be revised off the back of the PC beta, but as long as controllers get any aim assist at all, there’s a second concern. It’s great to see Bungie taking security on PC so seriously, but their assurances so far haven’t specifically covered this new issue. The drastic solution is to disable aim assist entirely in Destiny 2’s PvP – which most on the Reddit thread seem to think is a good idea. Another possibility is to separate PvP games by input. Which would you prefer?